The idea of the "razorback" is to get the most gain from the south. I used the site to direct a 45 degree angle off of the tip of the ridge. This allowed me to accept southern light from the side, and into the living space. This idea is conveyed in plan as well as in section. The angles introduce light to the space and create a plane for solar collectors to rest as well. This has a lot of promising strategies and ideas. They need to be fine tuned and polished. I need to look at heat/loss, energy needed from solar panels, and how much water to allow for the aquifers to accept. After reviewing how well my ideas were going to fare, I realized that I am going to have to address a lot of things. I think these issues are very manageable, but I want to really look at specific ways to solve these problems. As I start to design the final version of the house, I really have to work all of these ideas into one another. The recycling and reuse of the materials as well as their life after the building is dead is something that I want to look into more closely. 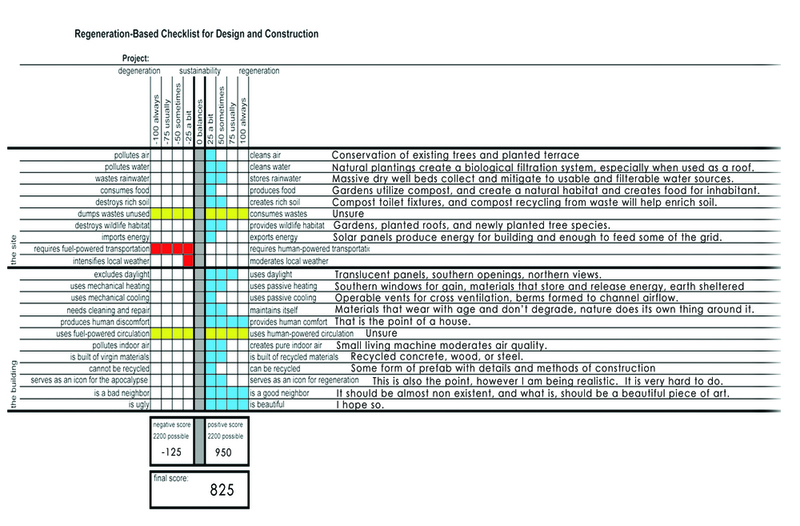 Cradle to Cradle was a goal that I set out to investigate, and have up until this point, not really considered it. 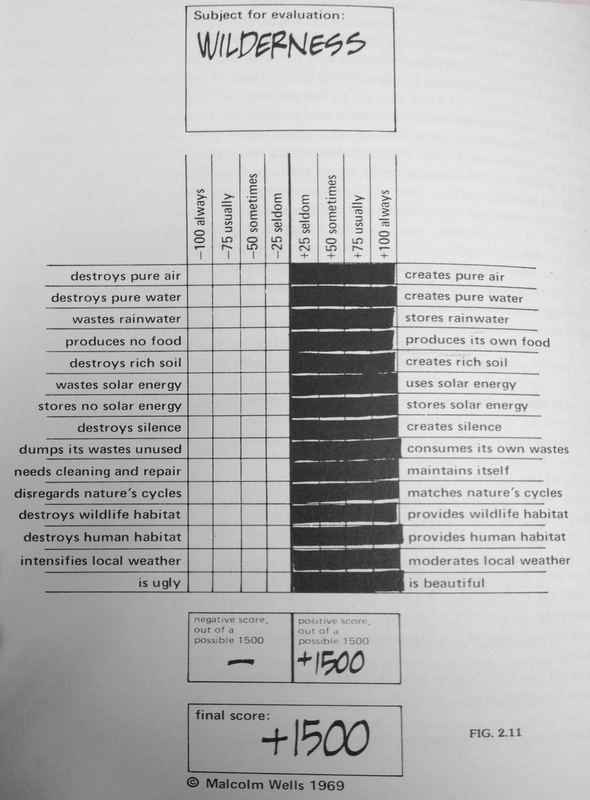 Another thing I want to look at is the consuming wastes, growing food, and enriching soil. These three things are all related and can be dealt with together. This may mean some type of garden that is used in the production of food, and as a filtering system for water. The waste from the house could be used to enrich the soil and decompose to create nutrient infused soil. I need to address exporting energy, or at least creating my own energy. Solar panels are easy enough, but how can that be beautiful without looking like a machine. I may also consider some type of hydro energy, but I am not sure of the feasibility of that. Water collection was one that I almost forgot about. I talk about percolation beds but what if I could capture and use some of the rainwater before dumping it back to the river. This will be another thing to think about not only for the function, but for aesthetics. How do I hide a water collector? I have a lot to fine tune, but this gives me a starting point and goal to surpass. A lot of this will be hard to quantify, so I really want to be as accurate as I can be with heat loads, water consumption and usage, as well as solar energy needed to run the house. Once I finish a few more iterations I am going to have to pick something and run with the idea that can present the most effortless advantages. After that, I will need to tweak and adjust things to satisfy nature, the client, and my design goals. I felt the need to experiment a little bit with this one. I knew that the hill on the south side would make a really interesting place to propose a structure. I wanted to look at another option that I thought presented some interesting things about it too. 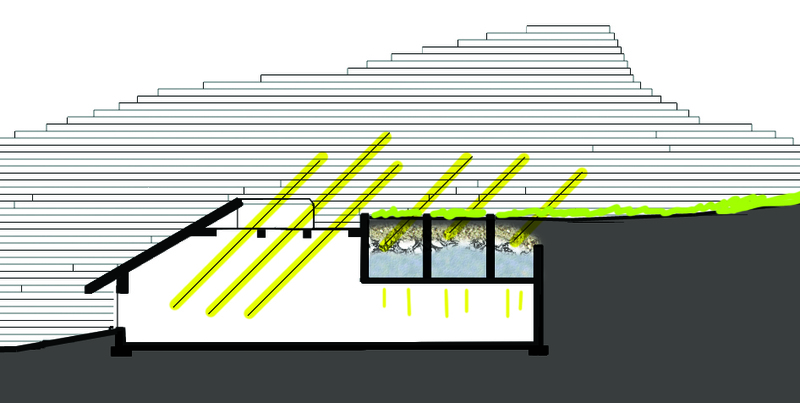 The ultimate goal for this iteration was to create a berm and funnel the airflow through the structure. I also wanted to create a mezzanine level for the second floor that overlooked the living and kitchen space. This would allow me to achieve light while also being able to add solar gain to the space. I also made half of the roof garden terraces, and one large sloping roof that overflows directly into a percolation bed that ultimately acts as an overflow for flooding and sends water off of the building directly back into the stream once it filters through the percolation bed.The berm helps to channel the airflow through the open cooridor and passes through the other side of the structure. This option has a few good things about it. It utilizes a rather small footprint. It allows for a lot of southern light an solar gain. 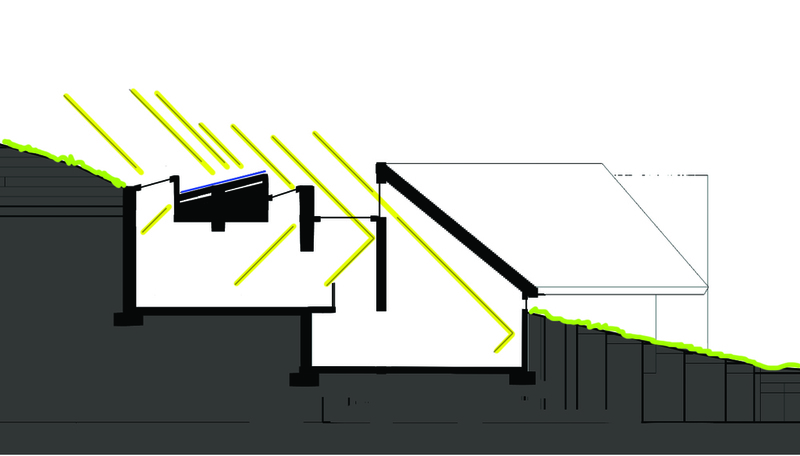 Overhangs and terraces shield for passive cooling. The percolation bed addresses water run off. Small northern windows minimize heat loss. The problem with this version would be that it is very close to a flood plane, and access would have to be addressed to get across of the smaller "Yut-Dut Run". I felt I had to at least try one that could take advantage of the southern facing orientation. This option is really interesting to me; I am surprised it turned out as well as it did for my intuition to use the hill first. This one really has a lot of potential as far as sustainable strategies goes. I am anxious to finish up my iteration 3. These first two have been intuitively my style and natural design. I am really going to try and mix it up for this last iteration. My process for iterations is not to create a set scheme. The idea for me, is to play around with ideas, how certain strategies might work, site placement, and a rough idea for square footage. 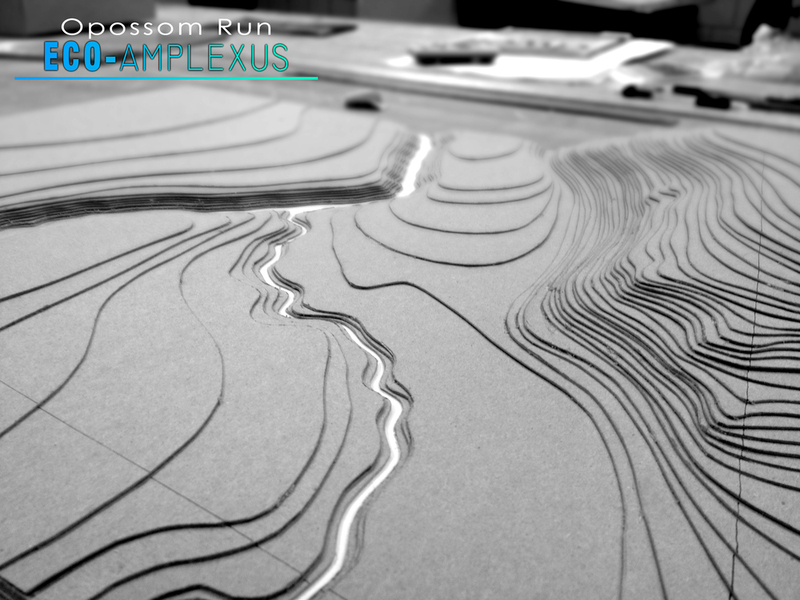 The site for the ECO-AMPLEXUS presents a lot of nice things; water, hills, and privacy. My goal for these iterations is to treat each one a little different and unique, and try to infuse different styles and ideas together to get an idea of what may work best for the site, my goals, and the clients needs. I knew I wanted to at least present the idea of an earth sheltered dwelling. The bad part about the site is that the hill is a north facing slope. It would be typical to dig the house into the side of a south facing slope, open up the front for sunlight and solar energy. In this case, I am still burying the structure to get the thermal advantage. What I am attempting to do, is to introduce light from the south by ways of the skylights and light wells. With the help of a material like concrete or stone, I could absorb the solar energy and transfer it to where I would feel the space would need it. Keeping the windows to a minimum on the north side allows me to retain as much energy as possible. My goal was to create a funnel entrance. As you walk up the steps and go into the earth, I would imagine it to feel a bit dark, because I would want the space to be flooded with light when you actually entered to create a very special connection with the architecture. The rest of the plan is just a play off of geometry sliding around to arrange the spaces from private to public. I like the difference from plan to elevation. I see a lot of opportunity in the arrangement and things being able to be opened up. This has some good things about it. I feel that the lack of light and solar gain could effect the space in the winter. I think this would fair better off in the summer when it would regulate its temperature more consistently without the need for much cooling. Prevailing winds come from the west, so I think that this could be another chance to do some type of passive cooling, the problem would be how to work it into this brutal shell without looking terrible. I began to construct my site plan today. I told Professor Morphew I would get it done tonight. He gave me a look of doubt. Ultimately, he proved much wiser than I, but I am proud of how much I got done in a short time. Building this site; watching it come to life, brings to mind how anxious I am to get started on the design. My research phase shed new light, and a new perspective on my outlook towards our jobs and responsibilities as designers. We have a duty to the client, and a duty to nature. I really hope that this online communication will prove beneficial as I am sure throughout the process I will be able to fine tune my methods and functionality. 1) 3 model iterations displaying form, concept, and orientation. 2) 3 matching drawing/sketch iterations displaying rough concepts, diagrams and sections. 3) Also, the addition of both digital, and physical site model. 4) Rough outline that starts to fill in how I will address the Malcolm Wells Model. 5) Slideshow to demonstrate my process, and progress up until this point.